Forum Index \ DriveHQ Service News, Announcements & Updates \ About Remote Drive Mapping - DriveHQ has a far better solution! Subject: About Remote Drive Mapping - DriveHQ has a far better solution! To a lot of users, drive-mapping seems to be the easiest way to access remote storage. In fact, most people have used network-shared drives in their local network. “Drive mapping on the Internet” is quite different, mainly because the Internet is far slower and less reliable than your local network. Most people are using 100Mbps or Gigabit network in their local network. However, the Internet connection bandwidth is usually only 384Kbps to 12Mbps. The speed gap is between 10 to 1000 times. Thus a “local network drive” is 10 to 1000 times faster than an “Internet drive”. As you read below, you will realize that Internet drive mapping does not work. When opening a 6MB file on an “Internet drive” using Windows Explorer, it will take 40 seconds just to download the file, assuming the network speed is 150KB/sec. After you have edited the file and click Save, it will take 40 seconds to save (upload). (assuming the upload speed is also 150KB/sec). During the 40-second wait time, your application is locked (non-responsive), and usually Windows Explorer is also locked. This sluggish performance may still be acceptable to some users. But read more below. be significantly slower than the download speed. Moreover, the upload speed is dependent on many factors; besides your local Internet connection speed, the particular Internet route determines the actual speed; more exactly, the slowest link in the route determines your connection speed. So even if you have a fast Internet connection, the max connection speed to different websites are different and can be much slower than your local Internet connection speed. Thus saving a file directly to an Internet drive could be even slower than scenario 1. Internet connection speed is dependent on the particular route. Internet traffic goes through multiple links (hops). Each link / hop is shared by thousands of other Internet users (just like the free way system). The speed varies from time to time. If there is a network congestion, your Internet drive could become inaccessible and your application/ Windows Explorer could completely lock up for a long time. This could easily result in data loss. A lot of applications automatically saves files from time to time to avoid data loss caused by application crash, e.g. Microsoft Office applications. When you are editing an Excel file on an “Internet drive”, Microsoft Excel will save the file every few minutes; because saving files takes a long time, Microsoft Excel will freeze periodically. Starting from Windows XP, Microsoft has added more multimedia features into Windows operating system. When you access a folder of pictures, music or video files, etc. Windows Explorer automatically creates different size thumbnails and preview images, which requires to access the original files. The performance is acceptable if the drive is a local drive (or local network drive). In case of “Internet drive”, if you have a folder with 200 JPEG images at 3MB each file, then accessing the folder in Windows Explorer could take: 600MB / 150KB = 4000 seconds. 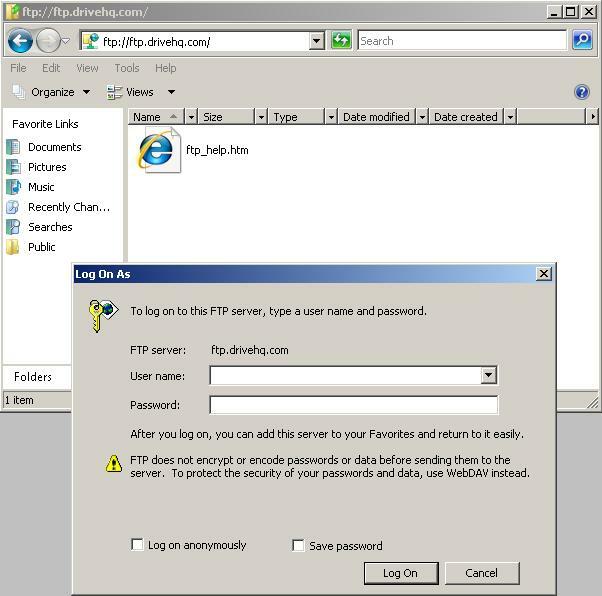 · It looks and works like Windows Explorer, supports drag and drop; users can easily access / manage local files and remote files using FileManager. · It never locks (or slow-down) your computer / desktop / applications, even if it is actively uploading / downloading lots of data. · It supports “Direct editing and saving of remote files”. Just double click on a remote file in FileManager to open the file for editing; after finished, click Save from the application. 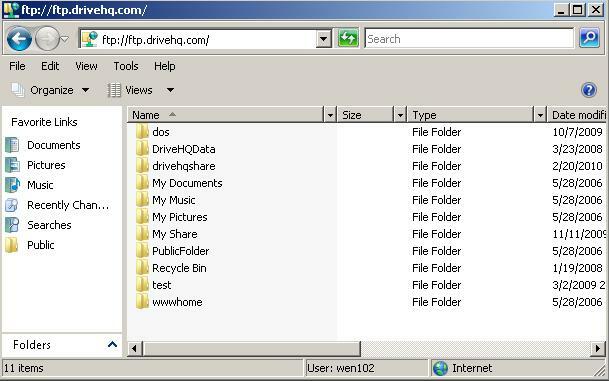 The file is saved to a local cache folder instantly, then FileManager will automatically sync the file to DriveHQ remote storage. · Users can also create synchronized folders between a local folder and a remote folder. Changes in one folder will be automatically synchronized to another folder. · When FileManager syncs a local file to the remote folder, it uses data compression. So a 6MB Office document could take less than 10 seconds to upload, much faster than in Scenario 1. · If during the save / sync process, your network is disconnected, you will not lose data as the file has already been saved to the local cache folder. Moreover, when network is re-connected, FileManager can automatically resume uploading from where it was interrupted. 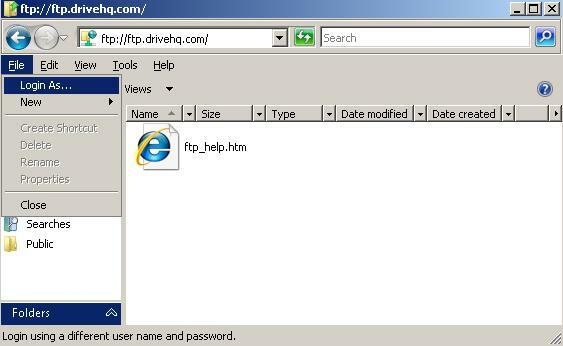 There is 3rd party client software that can map FTP Drives. It might work well, however, DriveHQ customer support will not officially support such software. Subject: Re:About Remote Drive Mapping - DriveHQ has a far better solution! WebDAV drive mapping was supported long ago. However, because WebDAV and Windows Explorer are inefficient and un-reliable, we stopped supporting WWWDrive (WebDAV drive mapping) a few years ago.